Owensboro, KY -- The International Bluegrass Music Museum invites you to ROMP June 28-30th at Yellow Creek Park in Owensboro, Kentucky. The International Bluegrass Music Museum's ROMP Festival will feature instrument workshops and late-night events in addition to main stage performances by some of the most exciting acts in bluegrass and roots-and-branches-of-bluegrass music. All-Star lineup to feature Vince Gill, Old Crow Medicine Show, Punch Brothers and Carolina Chocolate Drops. Announcing the ROMP 2012 line-up -- Vince Gill, Old Crow Medicine Show, Punch Brothers, Carolina Chocolate Drops, Pokey LaFarge and the South City Three, Lonesome River Band, The Deadly Gentlemen, Greensky Bluegrass, Farewell Drifters, Jesse McReynolds & Friends a Tribute to Jerry Garcia Songs of the Grateful Dead, Monroeville, 23 String Band, NewFound Road, The Expedition Show, Bearfoot, Renegade String Band, Some Rye Grass, Snap Jackson and the Knock on Wood Players, Grandview Junction, Renegade String Band, Town Mountain, Arnold Shultz Revival, Don Stanley & Middle Creek, Belfry Fellows, Bawn in the Mash, Higher Ground, County Line Bluegrass, NewTown, and the Museum's massive student brigade, the Kentucky BlueGrass AllStars. Free workshops will be held Friday and Saturday afternoon in specified picnic shelters, and nighttime performances and jams will begin after the main stage acts end each night. In addition to these fine, fine performers, Owensboro's best chefs will be offering their specialty items for the hungry at heart, and talented arts and crafts vendors and luthiers will be displaying their artwork and instruments for sale. 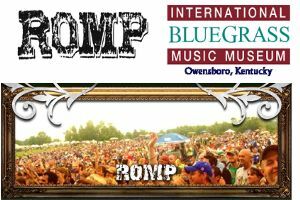 For more information call (270) 926-7891 or visit www.ROMPFest.com. For Tickets CLICK HERE.